In April 2017 we released our first-ever interview. It came shortly after the 2017 Rugby Sevens, and on the back of meeting Samantha Feausi from the Hong Kong Rugby Union. We had invited her to moderate our inaugural panel discussion, and as we talked about the landscape of sports for women and girls in Hong Kong, she suggested we meet Adrienne “Rocky” Garvey. So we did … and that’s how the WISE HK Interview Series started. Creating an interview series was not an original intention of ours. Yes, we did want to find ways to spotlight (or, sport-light as we say) women and girls in sports in Hong Kong, but we weren’t exactly sure how or in what format. In fact, we initially thought we’d do this via research and hosting speaker series. And so, at first, we set out to launch our inaugural survey in January 2017 and hosted the inaugural panel discussion in March 2017. Very quickly though, we came to realize we needed more ways to showcase the unique stories and perspectives of the women and girls who play sports in Hong Kong. The survey results helped us refine our efforts. We had learned that for our under 18 year old respondents, “fewer role models” was the second largest challenge they felt women faced compared to men when playing sports: 19% of our under 18s had indicated so, compared to 8%, 7% and 11% for our 19 – 29, 30 – 39 and 40 – 49 year old respondents respectively. We felt it was quite significant that our younger respondents were twice more likely to feel that fewer role models were a challenge. We wanted to do more to address this. One year on we’ve shared the stories of over 35 women and girls in Hong Kong. We’ve met some amazing individuals who have spoken with authenticity and wisdom, and who have touched us in so many ways. Our guiding principle was – and still is — simply to try as much as possible to share the diverse backgrounds and uniqueness of thought of the women and girls. Courage and ambition. Danielle Taylor shares, “I definitely think the mind set of being an athlete helps you have the courage, confidence and ambition to be a business owner. In the last 2 years, I have started up a business in a completely new industry, so I really feel it is like learning a new sport. You have to be coachable, have a good mentor and know that there maybe some times of failure along the way. In sport I have always wanted to win and be the best, and I certainly think this do or die attitude is what gives you that killer instinct in business as well. Coping mechanisms and overcoming fear. As Florence Pang shares, “It wasn’t until later on in high school did I recognize the tremendous stress I forced upon myself and the unhealthy amount of time I wasted on doubting my abilities. I picked up old hobbies that I almost forgot I once had. I began enjoying learning a lot more than before. I became happier. Going back into sports pulled me out of the dark pit that I was sinking in. I stopped putting down myself, the fear that was bottled in me vacated and I learned to face failures with poise while rejections with grace. 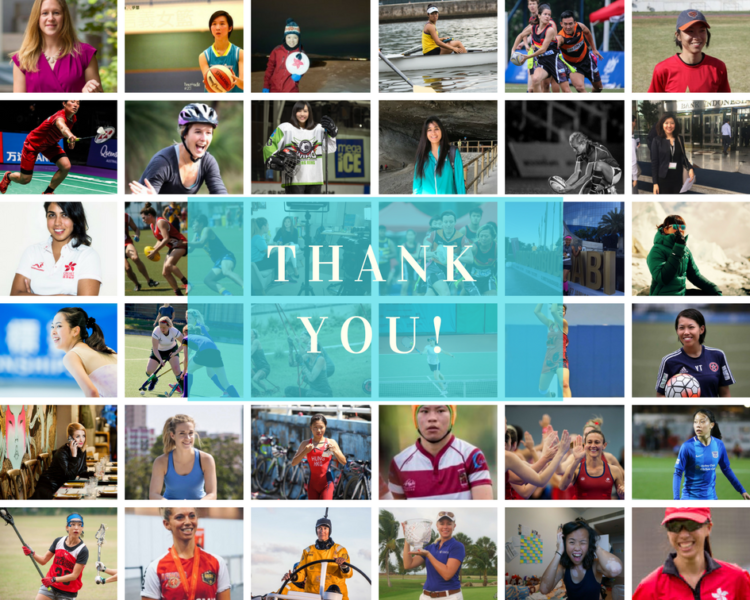 We’ve highlighted just a few of the reasons why sports matter to some of the women we have met with in the past who shared their stories and we know there are so many more reasons. We hope to continue to uncover more! To everyone who’s been a supporter of WISE HK, have read one or all the interviews, or if you’ve been interviewed in the past – a huge huge huge thank you to you all! And if you’re only stumbling across WISE HK for the first time, we hope you will keep coming back. We will continue to share the stories of more women and girls who play sports in Hong Kong. If you have any recommendations for us to meet with, or just want to leave some feedback, please do let us know by emailing us at wisewomenhk@gmail.com!